In a recent project we were able to value engineer a DC combiner feeder by running an overhead line rather than trenching an underground duct bank. The feeder would have been a 175 feet underground duct bank routed across a high traffic driveway with multiple existing underground its path. The overhead aerial line was installed at a much lower cost (no trenching, conduit, backfill, or asphalt repair) without disrupting the faculties operations with a road closing. The overhead run was constructed from EMT conduits with service heads installed at the top on both sides being supported to (2) 2” RMC support poles fived to the adjacent buildings. The 3 conductors were pulled from the combiner box through the service head and on the other end from the DC disconnect to the service head with 3 feet of additional conductor to create a drip loop. A 66’ piece of aluminum triplex 4/0-4/0-4/0 was fastened to an Arlington 610 porcelain wire holder on each RMC support pole. 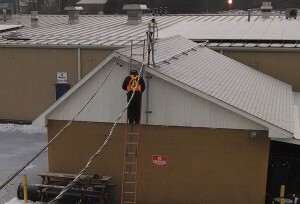 The overhead conductors were spliced to the THWN feeder conductors using Ilsco PBT-250 insulated splice connections.